First, it should be said that Winespace inc.’s Pool Night Junkies app is not a game app. Rather, it is an app that endeavors to teach you cushion systems of pool, thereby improving your billiard skills. (According to their description, a “system” is a way to estimate the course of your cue ball using the diamonds/points around the table to calculate four arithmetic operations.) No need for you to memorize anything or calculate in your head; this app will do it for you. There are four system variations that this app features: Corner V (Five & Half), Half V, Plus Two, and Bank Shot. Once you choose one, a simulation mode will open up; double tap to switch from that to the standard line display mode, which gives you an amazing amount of options as to where you can shoot. You can maneuver the cue ball and the spot of the cushion where it’s supposed to bounce off (marked by a red number) by tapping, holding, and dragging your finger on either. Tap the info button on the bottom right to receive more detailed advice. Enjoy! As someone who can barely break and definitely does not use the cushions, this app is a bit of a blessing in very pretty disguise–check out that gorgeous splash/main page. Pool Night Junkies covers a extremely wide spectrum of potential shots, especially with the option to move the ball and cue sticks around. It’s a smart game that requires a bit of visualization and calculating, and this app can support you in your time of billiard need. Brush up and build up those pool skills with the $0.99 Pool Night Junkies app; it’ll be worth it when you win it back. 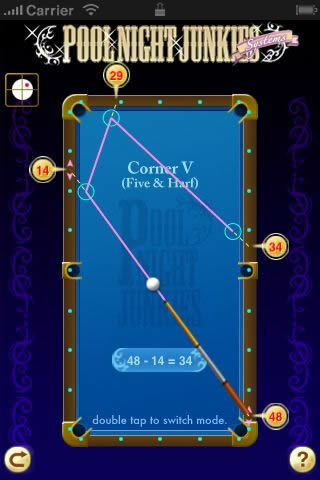 AppSafari review of Pool Night Junkies – Systems was written by Julie Guan on June 1st, 2010 and categorized under App Store, Education, Sports. Page viewed 5191 times, 2 so far today. Need help on using these apps? Please read the Help Page.